Product prices and availability are accurate as of 2019-04-11 17:38:26 EDT and are subject to change. Any price and availability information displayed on http://www.amazon.com/ at the time of purchase will apply to the purchase of this product. Running a business is hard work, keeping it secure shouldn’t be. 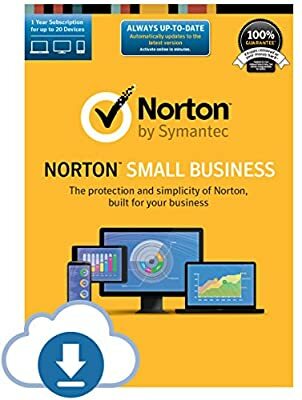 Norton Small Business combines trusted Fortune 500-level security with ease-of-use designed for you. A single subscription protects sensitive company and customer data on multiple devices, from computers to smartphones. And no IT skills are required for the simple set-up. With Norton Small Business, peace of mind comes easy. Let us focus on protecting your business, so you can focus on growing it.